There are dozens of cat cafes around Taiwan, and Eslite bookstore has a book in Chinese (貓日和咖啡館) introducing all of them. I’m planning to visit as many of them as I can, take pictures and review them here. 臺灣有很多貓咖啡館. 我在成品買一本書’貓日和咖啡館‘介紹30家. 我要去全部的書裡面的咖啡館 (好要找到更多), 拍照, 寫文章, PO上這各部落客. Since my apartment doesn’t allow pets, I think cat cafes are a great idea. Customers can go in, buy a cup of coffee, and play with the cats as long as they like. 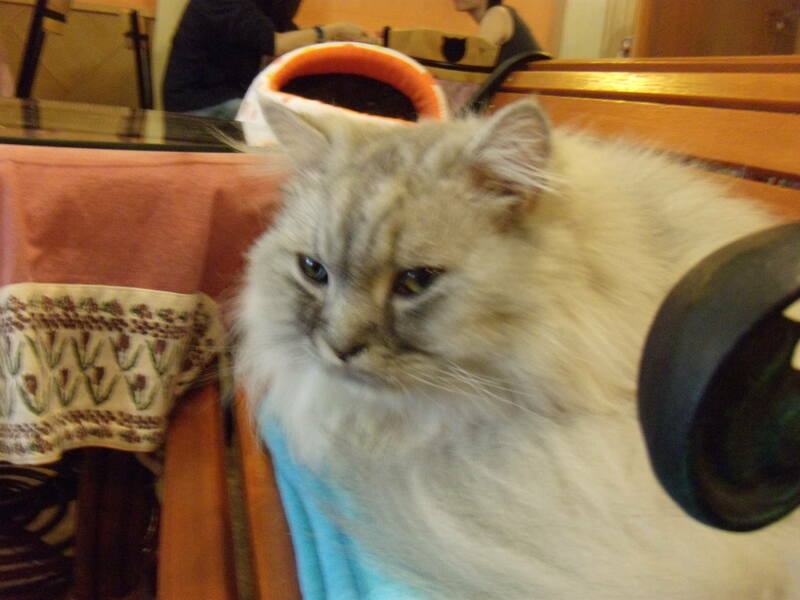 Some cafes have more than ten cats while others have just a few. 我覺的貓咖啡館很讚因為因為在我現在住的地方, 不可以養寵物. 在貓咖啡館, 客人可以喝咖啡, 有貓陪他們. 有些咖啡館十幾隻貓, 有些只有一隻. Hi, I am planning to visit Taiwan end of this month and I happen to find your blog. It’s very informative and you are very direct in your review. Hi! I’m very happy to find your website! I’ll be going to Taipei in December. Out of all these cat cafes, which one do you recommend the most? I would like to go to one with a lot of cats and decent food. For the most cats and greatest variety of food, I’d recommend Cat Rain, in Danshui. It’s a bit far from the center of the city, though (at the very end of the MRT). For someplace closer, I’d recommend Cafe Dog and Cats, near Zhishan. It was the very first cat cafe, they have about ten cats, it’s very clean and they have a pretty good selection of food. Wow awesome blog! I found your blog when searching for “Yard Cafe in Taipei”. I recently visited Yard Cafe and loved their two cats. It’s seriously made me want to have a cat of my own. So I also have a Taipei coffeehouse blog: http://www.taiwanlovescoffee.tumblr.com. Feel free to check it out! Definitely going to try and visit some of the places you’ve featured on your blog. Thanks! I just visited your blog and might check out a few of those. I love finding good coffee shops even if they don’t have cats. Have you heard of the Fairy Cafe by Qizhang MRT? It was started by a South African couple and they also serve food with some South African specialties. I really like their brunch, and it’s also just one of my favourite cafes for a quiet place to work in the afternoons. Cheers for creating this – found the blog on Google when my partner and I were wondering what to do on a rainy day in Taipei (and ended up visiting most of the cafes recommended!). We were so pleased with our experiences, we plan to open a cat cafe in Keelung at some point next year (got to get visas sorted and everything). Watch this space! I soon come to Taipei and would like to visit some of these places. Are there any cat cafes near Wenshan district / Taipei Zoo? I don’t think there are. Someone told me a while ago that there was one near National Chengchi University, but I looked it up and it seems to have closed. I think the closest ones to that area would be at Gongguan. Mr Poison, just a couple minutes walk from Gongguan MRT is nice. Also, the ones at Shida (Taipower Building/Guting MRT)–Classic, Cat.jpg, Catmints–aren’t too far. Of those, I’d recommend Classic as the best. as I’m one week in Taipei I have enough time to check out these places. We don’t have such (yet) where I live. This is Annie Liao from Radio Taiwan International. Your blog is awesome. I’m thinking about doing an episode introducing Taiwan’s cat cafe/restaurant/business on my show, so I’m wondering if you are interested in giving an interview and sharing your experience. Thanks! Glad you like the blog! I would be interested in giving an interview and just sent you an email. I don’t know for sure about any, but you could try calling this one: https://taipeicatcafes.wordpress.com/2015/04/18/double-like-%E9%9B%99%E5%80%8D%E5%96%9C%E6%AD%A1/. They do let people book the whole place and I thought it seemed like a strange place to have a party, so maybe it is for photos. It does look like a good place for it; the lighting would be good. Great blog! I’m an American who is traveling all summer and visiting cat cafes in Asia and Europe. I’m flying to Taiwan today, and I’m so happy to have found your blog. I recently started my own (lattecats.com) and will be writing posts about all the places I visit. You’ve been to so many! there’s a hair salon behind FuXing Sogo with 4+ cats called D+ Hair Design. their one eyed cat is a total lap cat, while the others like lounging in their front yard.